Nonacademic Skills Are Key To Success. But What Should We Call Them? : NPR Ed Half the picture of student success is something other than academic. So why can't someone come up with a better name for them? But no one agrees on what to call that "stuff". "Basically we're trying to explain student success educationally or in the labor market with skills not directly measured by standardized tests," says Martin West, at the Harvard Graduate School of Education. "The problem is, you go to meetings and everyone spends the first two hours complaining and arguing about semantics." West studies what he calls "non-cognitive skills." Although he's not completely happy with that term. The problem isn't just semantic, argues Laura Bornfreund, deputy director of the education policy program at the New America Foundation. She wrote a paper on what she called "Skills for Success," since she didn't like any of these other terms. "There's a lot of different terms floating around but also a lack of agreement on what really is most important to students." Yet he didn't come up with a good name, either. So, in Webster's tradition, here's a short glossary of terms that are being used for that cultivation of the heart. Vote for your favorite in the comments — or propose a new one. According to the Partnership for 21st Century Learning, a research and advocacy group, these include the "4Cs of critical thinking, collaboration, communication and creativity," as well as "life and career skills" and "information, media and technology skills." Character education has a long history in the U.S., with a major vogue in the 1930s and a revival in the 1980s and 1990s. 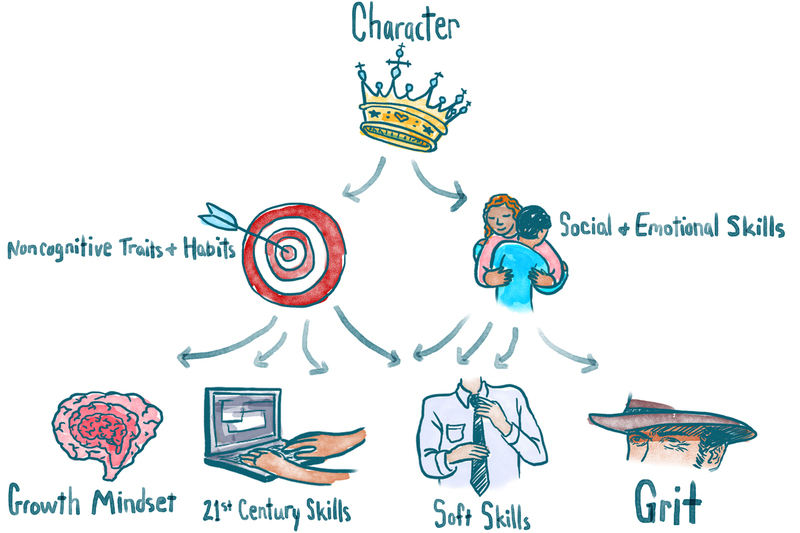 Beginning a few years ago, the KIPP charter schools in New York City started to emphasize a curriculum of seven "character strengths": grit, zest, optimism, self-control, gratitude, social intelligence and curiosity. Grit is a pioneer virtue with a long American history — think of the classic western True Grit. When Angela Duckworth was working on her dissertation in the mid-2000s, she chose the term to encapsulate the measures of self-control, persistence and conscientiousness that she was finding to be powerful determinants of success. It quickly caught on — maybe too quickly, the University of Pennsylvania psychologist says. "I'm grateful for the attention, but that gratitude and amazement was quickly replaced by anxiety about people thinking that we had figured things out already." She's worried that grit is being overemphasized: In a recent paper, she argued that grit measures aren't ready to be incorporated into high stakes accountability systems. "I'm also concerned that people interpret my position to be that grit's the only thing that matters." Larry Nucci at UC Berkeley, who has studied moral development and character education for 40 years, has stronger words for grit. "I think it's flavor of the month. It's not very substantive, it's not very deep." "In my research papers I had some very, very clunky scientific-sounding term for the fixed and the growth mindset," she says. "When I went to write the book I thought, these will not do at all." "When people start thinking, 'I'll make the kids feel good and they'll learn,' that's how something like the self-esteem movement gains traction," — a 1980s trend that led to lots of trophies but little improvement in achievement. This term is "ugly, broad, nonspecific," argues Carol Dweck — and she's a fan. "I'm the only person who likes the term," she says. "And I'll tell you why: It is a very diverse group of factors and the reason it's been hard to come up with a name is that they don't necessarily belong together." Martin West at Harvard uses this term himself, but he says he's always careful to acknowledge that it can be "misleading." "Increasingly teachers who are on the front line say that it's very important to teach kids to be more socially and emotionally competent," says Roger P. Weissberg, chief knowledge officer of the Collaborative for Social and Emotional Learning (CASEL), which promotes the concept and the term nationwide. "Teachers feel, and growing research supports, that it helps them academically, it improves school climate, it improves discipline, and it's going to help them to be college and career — and life — ready." The only problem is that the "skills" part may not be seen as encompassing things that are more like attitudes or beliefs, like growth mindset. And the "social and emotional" part, again, may be seen as excluding skills that are really cognitive in nature. Employers commonly use "soft skills" to include anything from being able to write a letter, to showing up on time and having a firm handshake. Most of the researchers I spoke with felt this phrase downplays the importance of these skills. "Soft skills, along with 21st century skills, strike me as exceptionally vague," says West. "I don't know that there's anything soft about them."